This navy and blush cold shoulder floral maxi dress is a great off-the-shoulder dress for a wedding guest! Shopping sources and links in italics use affiliate links. 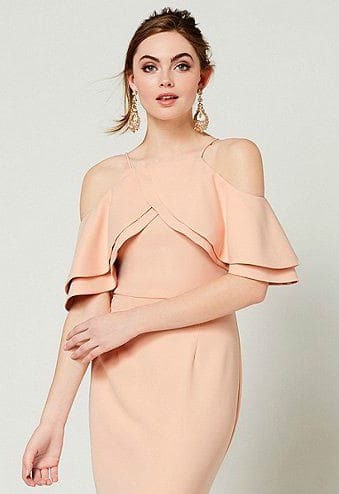 Cold-shoulder dresses are in! 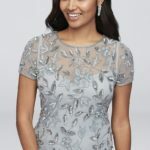 If you’ve been shopping recently, or keeping an eye on spring and summer style trends you’ve probably noticed that off-the-shoulder and cold-shoulder details are really, really taking center stage right now. Lots of cute summer tops are sporting this look, as are so many of the pretty spring and summer dresses. Another spring trend is pretty spring floral prints set on darker backgrounds, and when it combines with the flowing elegance of a maxi dress – it makes for the perfect romantic wedding guest style. One of the designers that does this floral look in such a beautiful way is Yumi Kim. These floral patterns are such pretty prints, and put with the relaxed elegance of these gowns makes them perfect for everything from a garden wedding to a formal summer invitation. They are beautiful styles for guests of tropical, beach, and coastal weddings, as well. This print is one of my absolute favorite with its pretty navy and blush pink tones, but you might want to take a look at more Yumi Kim dresses at Revolve and find the print you love! 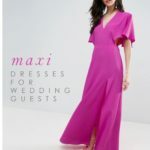 We also love the stylings of the floral maxi dresses Lulus and at Show Me Your Mumu – there are a lot of off-the-shoulder floral prints, as well as other styles – the collection is great for bridesmaids, but totally appropriate for wedding guests too!